Foals are adorable and the idea of raising a foal can be tempting — very tempting. The reasons why owners breed a horse is often a combination of emotional gratification, performance expectations, and economic gain. Yet none of these outcomes are ‘for certain’ and so the eventual outcome of the foal as it becomes an adult horse is also uncertain, even more so if the young horse does not meet the expectations of its owner. There are three aspects about breeding horses that most horse owners find surprising whether or not they are a novice or a seasoned breeder. The first one is the substantial financial commitment necessary to birth a foal and raise a young horse properly. The second one is the length of time it takes to realize the outcome of the financial investment from foal to ‘purposeful’ horse. And the third surprise is just how much education is required to fulfil the intended outcome — beginning with a barren broodmare and following through with the resources necessary to create a well-mannered, educated, and enjoyable horse. Horses are expensive creatures to care for properly and the financial implications of bringing a foal into the world are significant. There are those who believe that having their own mare produce a foal seems like a cheap way of getting another horse, however, this is far from the truth of the matter when you consider all the costs necessary to conceive, birth and raise a foal, and continue its schooling as a young horse. For the same price, one could buy a fairly expensive well-trained horse and it may be valuable to consider that ‘that’ horse already exists and needs a new home. It’s easy to overlook some of the hidden costs of breeding and raising a foal. Oftentimes stud fees, initial veterinary appointments and mare care are only the beginning, and a horse owner can accumulate a considerable amount of costs in feed, husbandry, and training of a young horse long before a suitable evaluation and assessment of the abilities of the horse can be made. It is not unreasonable for this investment to take as long as five to eight years to realize its full potential. Even with a string of sound and sensible decisions there are risks to both the financial investment as well as the lives of the animals when unexpected injury, illness and even death occur. First off, it is rare in today’s modern horse world for a herd of mares to be running with a stallion. Breeding of horses has become a sizable industry and a business all onto its own with a great deal of human intervention. Breeding pairs are often chosen accordingly to paperwork and performance statistics and the mating pairs can be miles, even countries apart. Breed selections based on these criteria often underscore robustness, conformational flaws and unsoundnesses. Furthermore, high-profile stallions become overrepresented in the horse population. Whenever pedigree lineages are closely shared between the mare and the stallion (i.e. common ancestors appear on their registration papers), the outcome is inbreeding. 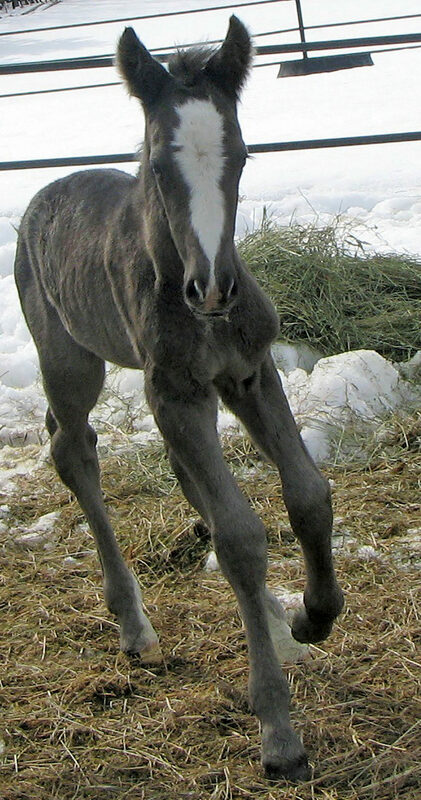 Although the term line-breeding is used to preferentially refer to these matings this term does not absolve the foals that result from these matings from their increased prevalence of genetic disorders. It can be an incredibly rewarding experience to breed a mare and raise a foal. To ensure the best outcome for all parties — horse and human — it requires plenty of deliberate thought regarding the responsibilities and commitments from the human to assure the finest of welfare for the foal-horse. Fortunately what are good decisions for the horse are ultimately good decisions for its human steward.